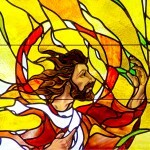 Our stained glass windows were installed in 1995 while Monsignor Kelly was pastor. They we dedicated by James Cardinal Hickey, Archbishop of Washington, D.C., on December 3, 1995. These windows were erected for the greater glory of God in this place. Peter to be His Apostles. The words, “Come with me and I will teach you to be Fishers of Men” become entwined in the nets of the fishermen, changing their lives forever. Auras of light and color flow together to become halo effects as they recognize Jesus and answer His call. The nets become symbolic as they flow from the Apostles into a sea of darkness and ignorance. The persons portrayed within the netting could be the first followers, the faithful of the past, present, or future, who have responded to the invitation to come forth from the darkness into the light by their allegiance with Jesus Christ. This side depicts the images of the Old Testament finding fulfillment in the New Testament. This scene begins with the deluge where the Ark emerges out of the darkness on the crest of the Flood. Great hope is realized in the symbol of the rainbow. Special attention should be noted of the grapevines which appear throughout beginning with grapes planted by Noah upon arriving on Mount Ararat. These vines weave through all the windows representing the human repopulation of the earth and our union with the Lord. The twelve stars represent the exile of the twelve tribes into Egypt, passing the Burning Bush onward to the Star of David. The Scrolls of the Law and the Prophecy can be seen merging from the Ark of the Covenant. The center window depicts the fulfillment of the prophecy and the promise of the New Covenant with the Nativity Star eclipsing the Star of David. The vineyard theme continues through these windows to the wedding at Cana where Jesus performs His first public miracle at the request of His Mother, Mary. 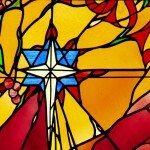 As wine is rooted in the vineyard, our Christian traditions are rooted in Judaism. This panorama narrative reflects this transition. Richard W. Podrasky II, Designer. Integrated Design and Construction, Inc.